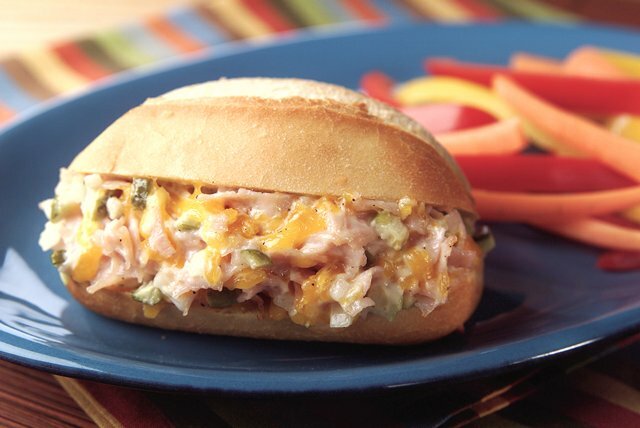 This roasted turkey breast sandwich gets a crunchy boost with finely chopped onions and kosher dill pickles. Combine all ingredients except rolls. Fill rolls with turkey mixture; place in shallow pan. Cover. Bake 15 min. or until heated through. Substitute 1 cup chopped cooked fresh turkey for the OSCAR MAYER Shaved Turkey. Serve with your favorite cut-up fresh or steamed vegetables.